Rubi came across the YouTube videos unintentionally. They were Tanya lessons — from the central text written by the founder of Chabad-Lubavitch, Rabbi Schneur Zalman of Liadi — given by Rabbi Ben Tzion Krasnianski, co-director of Chabad of the Upper East Side. And they helped start her on the road to recovery from addiction. At an evening awards banquet on March 10, she joined hundreds of others whose lives have been touched by Krasnianski and his wife Chani over the two decades they’ve established themselves in New York’s well-heeled Upper East Side. 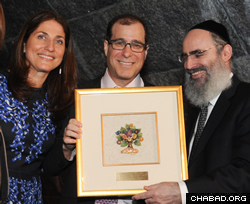 Since their first High Holiday services in 1992, the couple has held seders and Friday-night dinners, led Israel trips and started a preschool, built women’s groups and opened the Upper East Side’s only modern mikvah, among other accomplishments. They’ve also expanded to include the Chabad Israel Center, under the leadership of Rabbi Uriel and Shevy Vigler, and have a young professionals division led by Rabbi Yosef and Devorah Wilhelm. 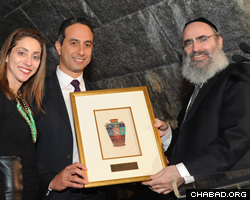 It makes him feel “tremendously warm and very good to be totally involved with Chabad,” said Schwalbe. Marc and Esther Sholes received community service awards. Sholes recalled how his children went to Chabad’s camp and preschool, with one of them volunteering with the Friendship Circle, a special-needs buddy program. The event, which started with an hors d’oeuvre spread in the foyer of Gustavino’s landmark building, opened into a dinner on its balcony, up a spiral candlelit staircase. Entertainment included Chassidic singer Avraham Fried, in addition to a live band and a raffle, with prizes including an iPod, a New York City getaway, jewelry, and grand prizes such as $10,000, a lease for a Lexus and a trip to Israel. Honorees for the evening were “Parents of the Year” Alexander and Diana Tsigutkin, and Albert and Ariel Sebag. Marc and Esther Sholes received community service awards. Marc Sholes — with Hanna, 13; Avery, 10; and Ezra, 6, in tow — recalled how his children went to Chabad’s camp and preschool, with one of them volunteering with the Friendship Circle, a special-needs buddy program. He and his wife have been on trips to Prague and Israel with Chabad as well. He said he brought his children so they could experience the spirit of those gathered at the event. Sholes also brought friends and supporters of his own, and said he hopes that they, too, come away inspired. Albert and Ariel Sebag received "Parents of the Year" awards. Michele Harris, who has lived on the Upper East Side since 1986, remembers when the rabbi held his first Tanya class at her house. She has counted on the Krasnianskis for help getting a kosher mezuzah, and it was her interactions with them that led her to revisit her religious upbringing. The Upper East Side is rediscovering and enjoying a millennia-old practice.